Like clockwork the latest edition of Mint Error News Magazine, issue #23, is now available. The free quarterly magazine is published by Mike Byers and is an absolute excellent resource for collectors who would like to know more or read about the very latest in minted error coins. On top of the informative value of the magazine, it also contains an excellent mint error coin price guide compiled by Al Levy of alscoins.com. Levy uses eBay as a resource and lists pages upon pages of recent closing prices for various types of error coins. While the content is first rate and the price guide valuable, what really places these free magazines over the top is the exceptionally high quality coin photos. The photos are like guides in themselves and are outstanding tools in identifying coin errors and building knowledge. 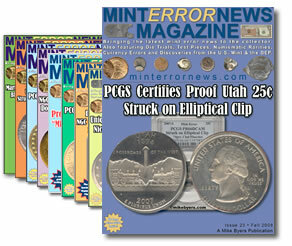 You can view the magazine and any back issues through the Mint Error News website. However, it’s always a good idea to simply download the magazine directly to your desktop. Because the magazines are so heavy in content with quality photos, they can be physically large in size and sometimes slower to scroll through online. Downloading the magazine to your computer and then reading it can make the experience more enjoyable. A listing of the magazine’s most recent table of contents is below. While reading the titles, imagine vibrant and descriptive photos for each major topic. As a reminder, CoinNews hosts "The Error Coin Price Guide" generously provided by minterrornews.com. By using the photo error coin guide, you can quickly find an error coin of interest, click its image and immediately go to the appropriate page with more information. You can of course find the same information on minterrornews.com.